I will close out my three weeks of scary movies with three fine adaptations of Bram Stoker’s superb novel. Other perhaps than The Bible and The Sherlock Holmes stories, no book has inspired as many movies as Dracula. Everyone knows the famous Bela Lugosi version, but few people are aware of the versions I am recommending this week. Count Dracula was broadcast on BBC in 1977, and is perhaps closer to the original text than any other version (except that Meena and Lucy are sisters rather than friends, and one of Lucy’s three suitors is omitted). The elegant French actor Louis Jourdan makes a memorable Count Dracula, conveying a mixture of civility, erudition, seductiveness, arrogance and menace. Equally good are Frank Finlay as a kindly, devout Professor Van Helsing and Jack Shepherd in an unusually sympathetic take on the madman Renfield. Props also to Bosco Hogan for vividly portraying Jonathan Harker’s progressive mental breakdown under the strain of being trapped in Dracula’s castle. The budget for the BBC production was clearly small, and that shows in some cheap special effects, the lack of any eye-popping sets, and the absence of mega-stars. But within the limits of a television budget, it’s a quality movie, especially the exciting closing confrontation between our heroes and Dracula. 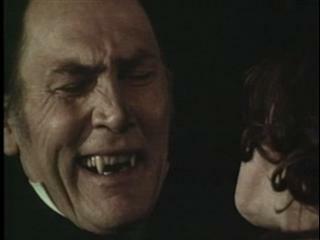 An even better TV adaptation, simply called Dracula, was made in 1973 by Dan Curtis of Dark Shadows fame. His frequent collaborator Richard Matheson departs substantially from the original story in his script, offering a fresh take on the world’s most famous vampire. Dracula, played with panache by Jack Palance, is as much sad as threatening, longing for the normal life he had centuries ago and seeming almost to regret his thirst for human blood. Matheson also strips down the number of characters (e.g., no Renfield, Dr. Seward, Quincy Morris or Arthur Holmwood) in a way that simplifies and helpfully speeds up the storytelling. My only gripe about Matheson’s changes is that Professor van Helsing was turned into a proper Englishman (Nigel Davenport) when he works better as an old-world character steeped in the mythology of nosferatu. Oswald Morris, whose work I have praised many times on this site, again offers fine cinematography, which enhances Curtis’ ability to deliver moments that make viewers hold their breath or let out a scream. The final forgotten Dracula I would recommend was made by Universal Studios in 1931. You are probably thinking “What does he mean ‘forgotten’, that was the most famous version ever, wasn’t it?”. The English-language version is indeed the most famous, but in the early days of talkies, films were not dubbed for foreign markets. Rather, the studios would shoot the same film twice with a different cast in a different language. That’s how the Spanish-language version of Dracula was made in 1931. Bela Lugosi, Tod Browning et al did their shooting during the day, and then a completely different crew and cast shot the same scenes in Spanish at night. The Spanish-language crew had a smaller budget, but they also had a distinct asset: They got to see the rushes that the English-language crew had shot that day. This allowed them to replace shots that were dull or didn’t work with new set-ups, and the result is much better camerawork in the Spanish-language version. This version also adds in a few scenes that make the story more coherent. I would not say it’s better than the Lugosi/Browning version, but I would say that on balance it’s just as a good and well worth your time both for itself and for comparative interest with its more famous twin. What, no love for “Andy Warhol’s Dracula” (also known as “Blood for Dracula”)? With Joe D’Allesandro as a communist? Really? 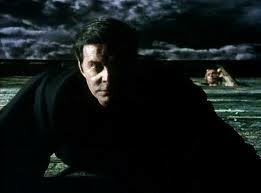 Richard Benjamin as Dracula? Wow. I guess I did see him play Von Helsing (changed to Rosenberg for professional reasons). Bram Stoker was a Dubliner. His native city is now trying to exploit the connection. There was a film version in 1979 with Trevor Eve as Harker, Lawrence Olivier as Van Helsing, Kate Nelligan as Lucy and Frank Langella as Dracula. There is no action in Transylvania, and the story all takes place in England. In the version, Dracula successfully completes his seduction of Lucy, and though she is apparently rescued, the ending is ambiguous. Next Next post: Ha. Ha.